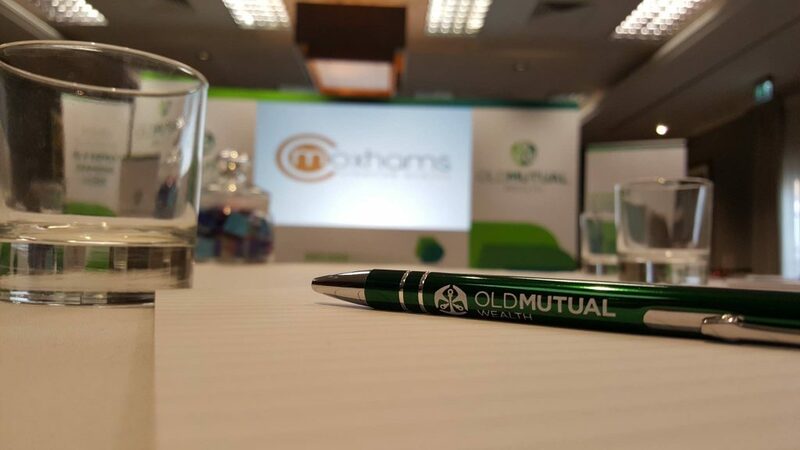 After working with Old Mutual Wealth for the past few years, Moxhams attended a catch-up meeting with the events team to discuss a few upcoming events in the pipeline, one of which was the Regulation Roadshow. 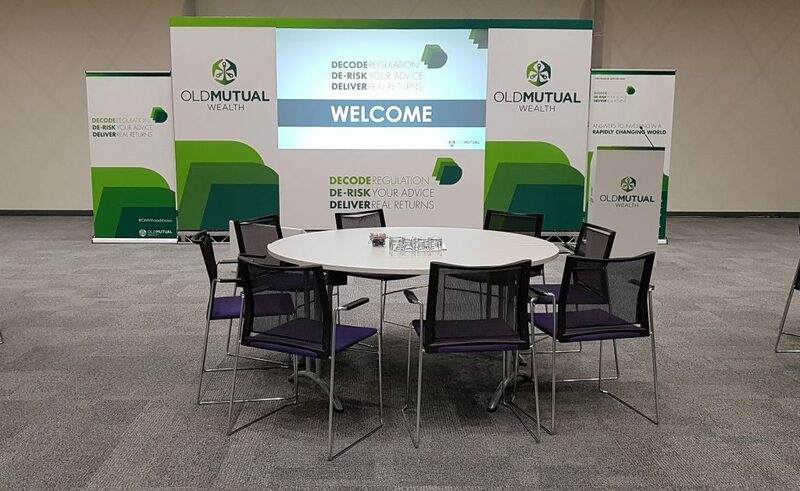 Planning to travel across the entire Country Old Mutual Wealth with the help of a few keynote speakers, wanted to Decode Regulation, De-Risk Advice and Deliver Real Returns. To help enhance their message, Moxhams contacted Techna Displays to find out more about the T3 Set System. Using the T3 Displays set enabled Moxhams to break down the set into one flight case. This meant only one vehicle would be required for transport, keeping the carbon footprint to a minimum whilst reducing costs to the client. The T3 is a great alternative to the traditional wooden set panels, they offer flexibility and customisation that would otherwise take days of preparation with a traditional wooden set. 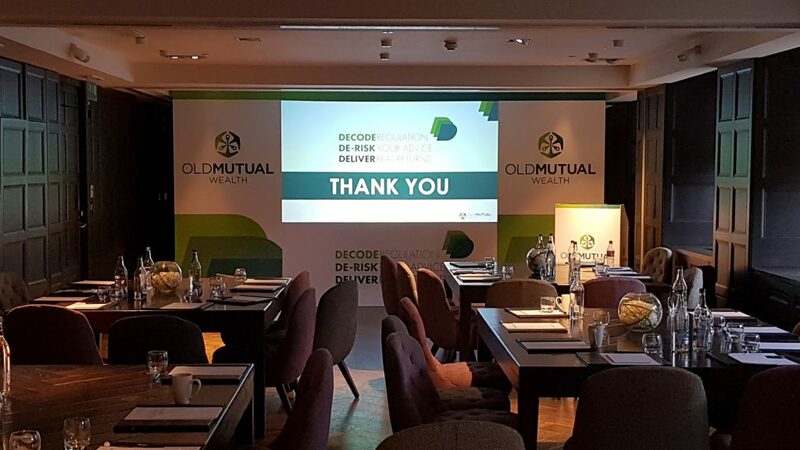 The set consisted of a 10’ x 5’7” rear projection screen, bespoke lectern and registration desk and a small PA system. Moxhams were really happy with the set, and efficiency of the equipment. Week one saw Rich and Colin on the road, visiting Celtic Manor in South Wales, Solent Hotel in Fareham and Sandy Park in Exeter. During week two Leon joined Rich, as they headed towards London and the surrounding areas including; Ashford Gold Club in Kent, Kingswood golf club in Surrey, Luton Hoo hotel in St Albans and ECT’s Venue by St Paul’s in London. Week three Rich and Leon headed the Midlands and Yorkshire, visiting St Johns in Solihull, The Mere in Knutsford by Manchester, Thorpe Park hotel in Leeds and Ramside Hotel in Durham. 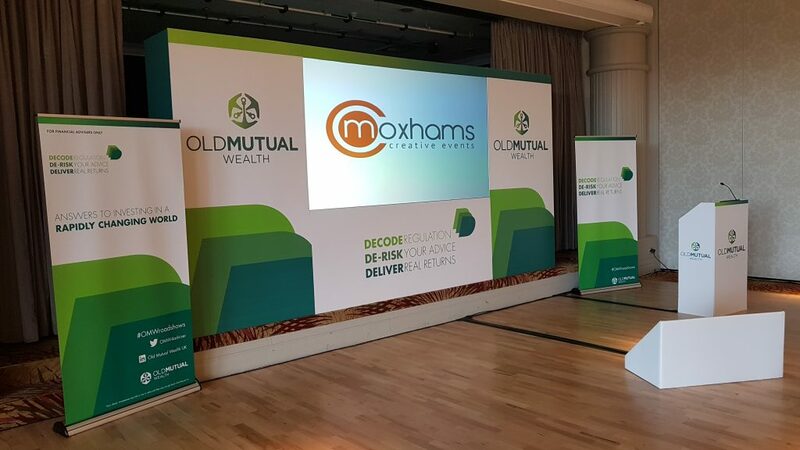 Week Four Moxhams headed across the border to Scotland, working in The Blythswood Square Hotel, Edinburgh’s Sheraton Grand and then heading South to the University of Leicester for the final show of the month. 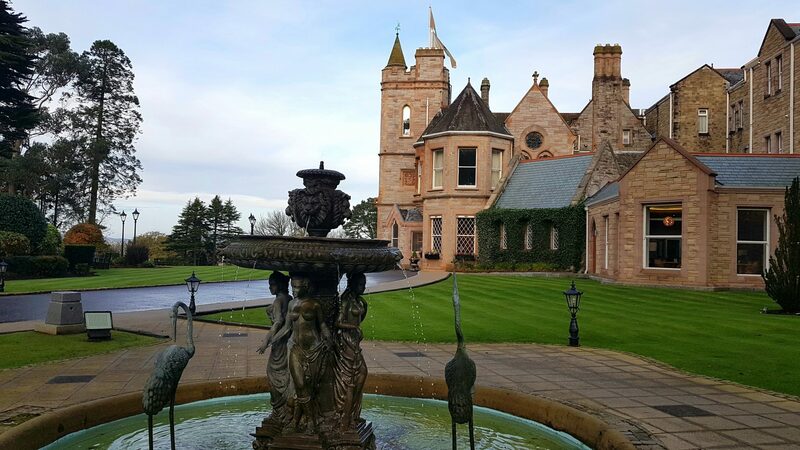 Having a few days’ rest, Leon and Rich then travelled over to Belfast for the final show of the roadshow, finishing in style the final show was held at Culloden House Hotel. An incredible venue in the Holywood Hills just outside Belfast.